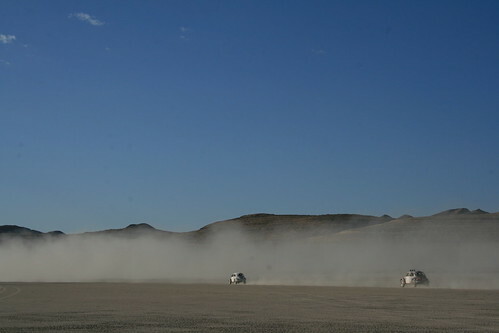 The Desert Dingo and Skittles take off, into a cloud of dust. Over Labor Day Weekend, VORRA held a 24-hour endurance race. It was split over two days, Saturday and Sunday. Each day you had 12 hours (from 8am to 8pm) to get as many laps that you could on the 40-ish mile track. 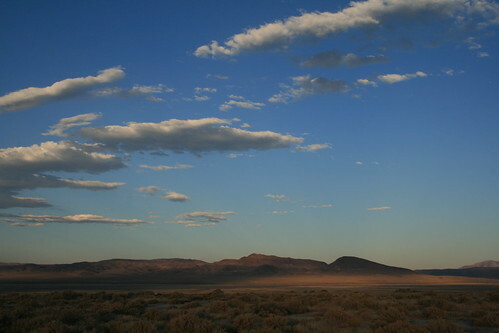 It went winding along the basin and range Nevadan desert, over playas and winding up canyons over the ranges. It was dusty as hell, but surprisingly not that hot! 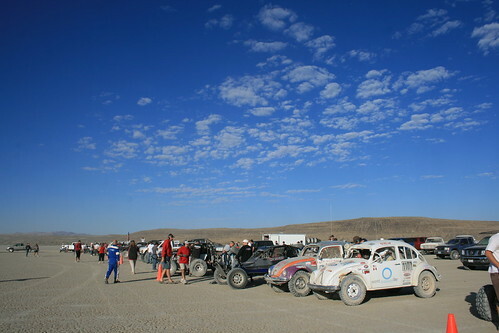 The start of race day #2 on the playa outside of Fallon, NV. It only got up to 90F, but you know, "Its a dry heat." So it was very manageable as long as you were in the shade. 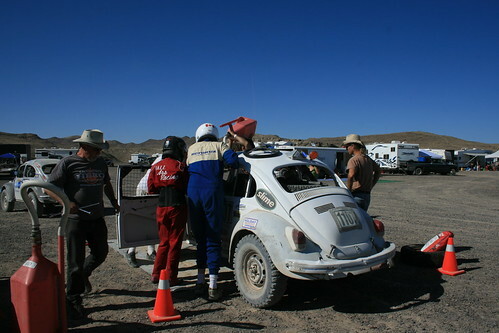 Romy got to the race early on Thursday night to help put the baja through tech inspection. The rest of the team arrived Friday night or Saturday morning. A lot of the people on the team were actually at Burning Man, so there were a few people helping out this race who normally aren't on the team. The Desert Dingo pulls into the pits. Romy had a lot of fun driving the car during both days of the race. 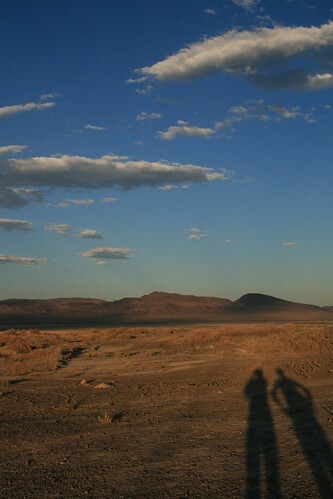 I had my first dust experience (which I had avoided until this weekend), and realized that the dust isn't that bad. Its so fine that you don't even notice it, except when it combines with the grease in your hair and forms a sticky form of natural 'hair product.' It gets all over, and can't be avoided, so you just have to accept it. 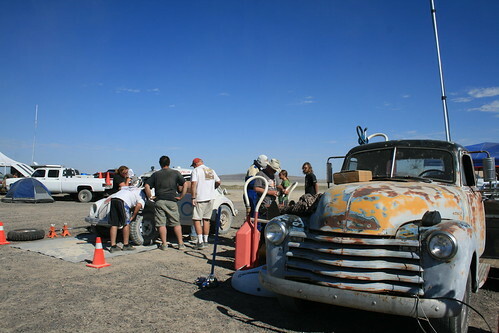 Another shot of the Dingo in the pits, and Crusty's cool old truck. Three Class 11 cars started the race, and we were the only to finish! One of the Class 11's broke down on the first lap on the first day due to a busted transmission. They put in a stock transmission another team gave them, and managed 1-3/4ths of a lap before that one broke as well. Then they just started partying. The other class 11 (Skittles) made it through most of the race but were taking it slow. They seemed to stop a few hours before the race ended, but I'm not sure why. We were able to finish 12 laps over the 24 hours! (7 on the first day, 5 on the second) Thats pretty damn good! Actually, it pretty amazing that we FINISHED the race without breaking down like the poor other bajas! This means that the Desert Dingo is still in first place in our class. Yay! First place! But, we did break both shock towers off the front, punch a huge hole in the drivers side fender, and totally screw up the front suspension. Fun! Next are some pictures I took as the sun was setting at the end of race day #2. The Dingo was on its last lap, but most cars were already done, so the air was quiet, calm, and clear. 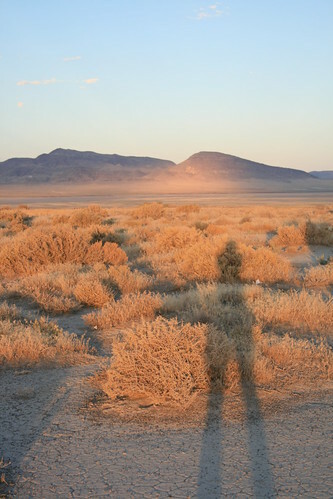 These next pictures are why I like the desert. Especially at sunset! Beautiful blue sky and poofy clouds. The sun burst through some clouds to give this shot a glowing effect. I did not photoshop this at all! I saved my favorite for last. 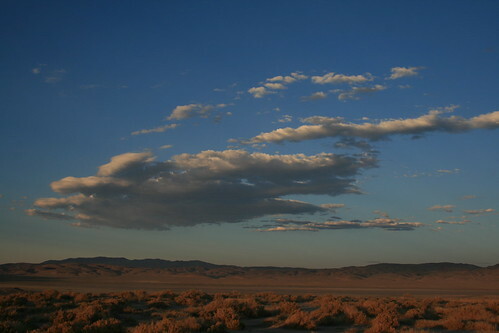 Typical basin and range landscape under a sky speckled with nice clouds. Your photos are amazing! Racing that Baja looks like a blast! Love your blog!